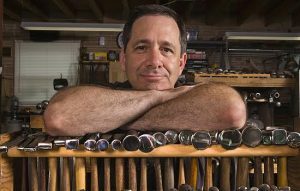 I started my business in 1984 and have garnered an international reputation for quality craftsmanship with special attention to surface finishing. I have repaired, reconstructed, and hand polished everything from historically important tankards, tureens, and tea services to inexpensive disposal-damaged and dishwasher-dulled flatware. Your object doesn’t need to be a museum piece for me to give it the same love and care. As an environmentalist, I use the safest, non-toxic, organic products available. My workshop is state-of-the-art in safety and cleanliness. I earned a BFA degree in silversmithing and jewelry making from Maine College of Art. Upon graduating, I was hired by Gorham as a designer, sample maker, and technical illustrator. When I left Gorham I took a position at Pilz Ltd. where I created ecclesiastical ware and learned the fine art of restoration. In 1989 I founded the Society of American Silversmiths to preserve and promote this beautiful art form. To learn more about the most thoroughly researched and practiced silver care information on the Internet, visit the Herman Silver website. With the love and care that your piece deserves and beyond, Jeffrey’s thoroughly researched skills are ready to help you too. Herman Silver Restoration and Conservation also has a website of their own, filled with great examples of their work and more information about their business. See their website here.